Are you looking for something special to give your little one for Valentine's Day? If so, I bet you are kind of disappointed by the lack of Valentine's themed gifts for children besides candy and stuffed animals. Obviously you could just get your child any toy as a Valentine's Day gift, but that is not nearly as special or as much fun. So what does that leave you? Well, I have the perfect thing. The VeggieTales - Lettuce Love One Another DVD exactly the kind of gift that is themed, fun, and will be entertaining for a long time. PLUS it's great as a combo gift for more than one child. And it is gender neutral. Isn't that adorable? I wanted to watch the whole thing after seeing that. And I did. I got it for my 5 year old son mostly, as well as my 16 month old daughter, but I also got it for me. I love VeggieTales. I love the good wholesome message, that is even more pure than most other children's programs. There are always great lessons and morals taught, and the stories are always very entertaining. Lettuce Love One Another is such a great DVD. There are 3 darling episodes that each teach love in different ways(patience, putting others first, helping others). There is also 5 mini episodes called Bible Bits. My son loves this DVD. He has probably watched it 30 times already. He is usually glued to the computer and does not watch much TV or anything in his room, but when I put this on, he will stay in his room until it is over, and even sometimes ask to watch it again. I am so glad that I found something to keep my son entertained(he loves to sing along), but especially something so educational. My little girl loves it too, and we love to watch it together. My husband even likes it, and he usually cannot stand other kids shows. This is a perfect gift for Valentine's Day, or just a great DVD to add to your child's collection. I give it 2 thumbs up. A+. And since it is so important to share with others(thanks for the lesson VeggieTales), I will be sharing a giveaway with all of you. So enter below for your chance to win this awesome DVD. And that's not all. Enjoy these wonderful printable activities. Z loves Veggie Tales so Mommy loves them, too!! I love the Bible based stories, but it seems they'd gotten away from that for a while. Maybe this one is back on track? Thanks for the giveaway! 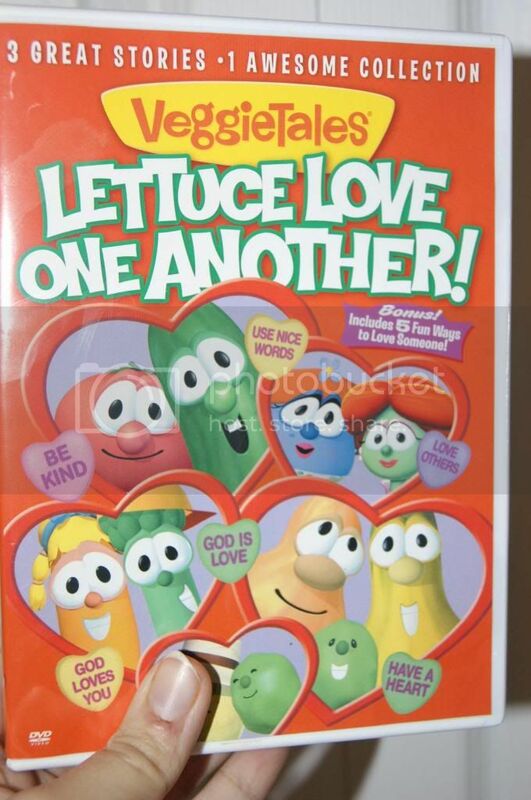 My kids love all the Veggie Tales dvd's...this would be great for Valentine's Day! Thank you!